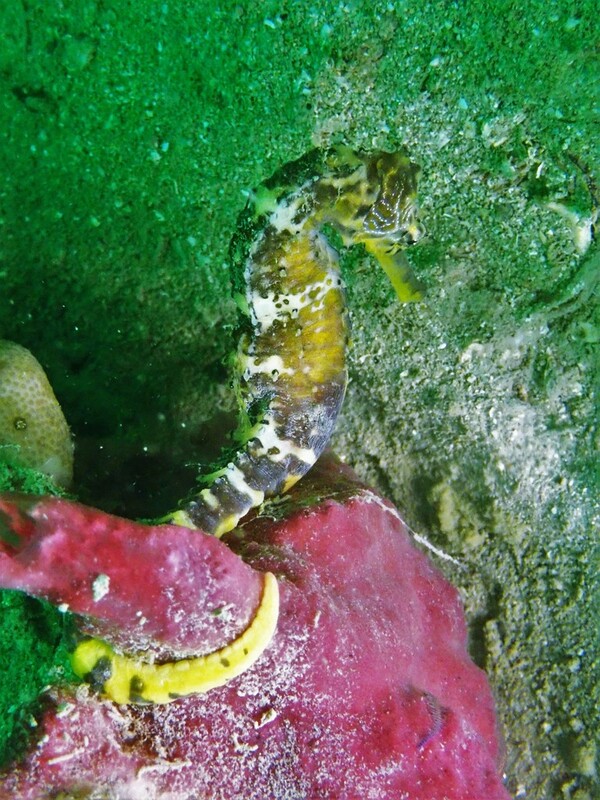 The first highlighted iSeahorse observation of the New Year features a tiger-tail seahorse, Hippocampus comes, courtesy of iSeahorse user tantsusoo. This winsome specimen was encountered on the coast of Jurong Island, a region of Singapore that was created artificially in 2009 by connecting 7 smaller islands. If you want to see a tiger-tail, you can also find them in India, Indonesia, Malaysia, Philippines, Thailand and Viet Nam. It depends what time you dive, though - like their feline namesake, this seahorse is mostly nocturnal. Across their range, H. comes is threatened by their desirability for use in both traditional medicine and the aquarium trade. One of the most heavily extracted seahorse species, the tiger-tail is listed as Vulnerable on the IUCN Red List. In the past, some regions of the Philippines contained 20 tiger-tail seahorses per metre squared, but that is certainly not the case anymore, as their population has been decreasing. While they are among the seahorse species most frequently removed from their environment, they also have the distinction of being among the most successful seahorse species to be bred in captivity. Compared to other Hippocampus genus members that have been reared in aquaculture, H. comes has high fertility and survival rates. If they can be raised in captivity instead, perhaps there will be less draw to remove them from the ocean. Tropical fish destined for aquariums are frequently trapped via an environmentally destructive practice called cyanide fishing, a capture technique that is prevalent in the Philippines. This technique uses a cyanide solution to stun fish, so they can be easily caught alive. Not only does exposure to this chemical appear to reduce the lifespan of captive fish, but its presence can be detrimental to the surrounding reefs, and fish inhabiting the area which are later caught for restaurants can have trace amounts of cyanide, which could pose a health risk to the humans that consume them. Tiger-tail adults and juveniles occupy different habitats, a useful survival tactic seen throughout the animal kingdom. Since offspring and their parents are not competing with one another, there is a higher chance that both can flourish. H. comes populations have been shown to benefit from Marine Protected Areas, which hopefully indicates that a similar allocation strategy could be effectively employed between seahorses and humans. If we use our resources wisely, there’s enough ocean to go around for everyone!